We were surprised to see how well the Optoma did against the Sony VPL-VW365ES. We were anxious to see how it held up against the Epson Pro Cinema 4040. The Optoma UHD65 delivers all 8 million pixels to the screen while the Epson 4040 uses a 4K “Enhancement,” or pixel shift, to create 4 million pixels on the screen. The question, then, is whether 4 million pixels are enough to compete with 8 million pixels in terms of the viewing experience, and what differences can the human eye perceive at viewing distance? The other question would be how well do the color and contrast compare since we are now comparing 3-transmissive LCD panel technology to 1-DLP chip technology? Weight: 24.3 lbs. 31 lbs. Good color still starts with good black and white. Both projectors were set to their factory preset 6500K settings and their best color modes for accurate color reproduction. Brightness and contrast settings were set using the above pattern from the Extron projector shootout calibration disc for a good balance of highlights and shadows. Again, neither projector had an ISF or detailed color calibration as we wanted to see how they looked out-of-the-box. In terms of rich, saturated, and accurate colors, both projectors performed well. The Epson Pro Cinema 4040 has a little too much green, but does have a slightly richer red. The Optoma UHD65 was actually a little closer to what a calibrated REC709 projector would look like. Unless they were side by side, the differences would probably be very hard to tell. The real test in our minds is how well they can reproduce skin tones. Even though they are both different, they each represented a very realistic and pleasing skin tone. If you look carefully at the Epson 4040 in the background, you will notice the slight green look to the out-of-focus curtains. 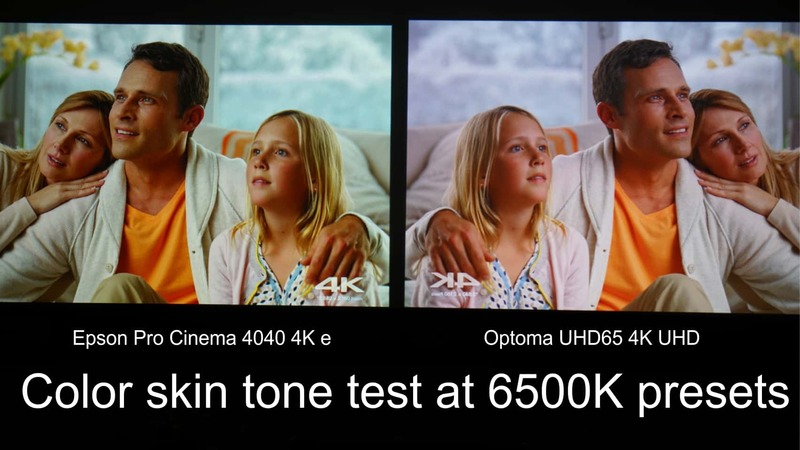 That is the white balance difference and what is causing the skin tones on the Optoma UHD65 to look a little different. I personally like the Optoma tones, but some may prefer the Epson. 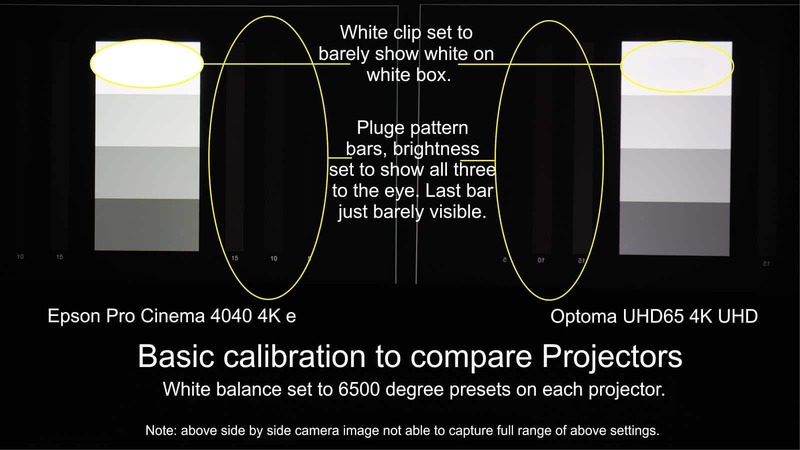 If they were both professionally calibrated for precise 6500K, they should look even closer. This is the area we were most excited to compare as we had read several online reviews that stated the the Epson 4K e-shift was almost visually identical to true 4K UHD at viewing distance. What we found was a very pleasant surprise. Not only was it very notable at viewing distance, but the overall sharpness and depth to the image was perceptibly better as well. To make sure we were looking at the same parts of the image, we again reversed the Optoma UHD65 on the right so we could examine the same areas both up close and from a distance. Download or right click to view higher resolution of above. If you look at the areas in the circles, you should be able to see a very noticeable difference in the actual detail. We expected this up close but were very surprised to find how much of a difference it made at viewing distance and beyond. We repeated this multiple times and with several technicians, and in each case the results were the same. True 4K UHD is noticeably sharper and more detailed even at viewing distance. 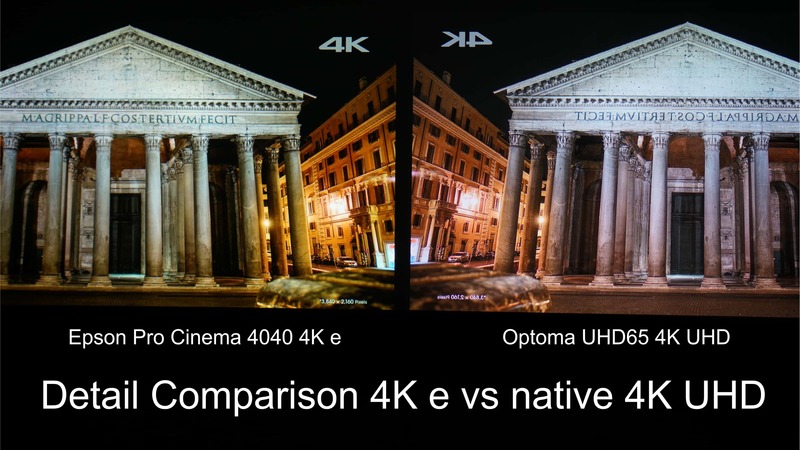 With good 4K source material, the Optoma UHD4K clearly has better detail and sharpness. It also has the benefit of almost no visible pixels lines or screen door effect. 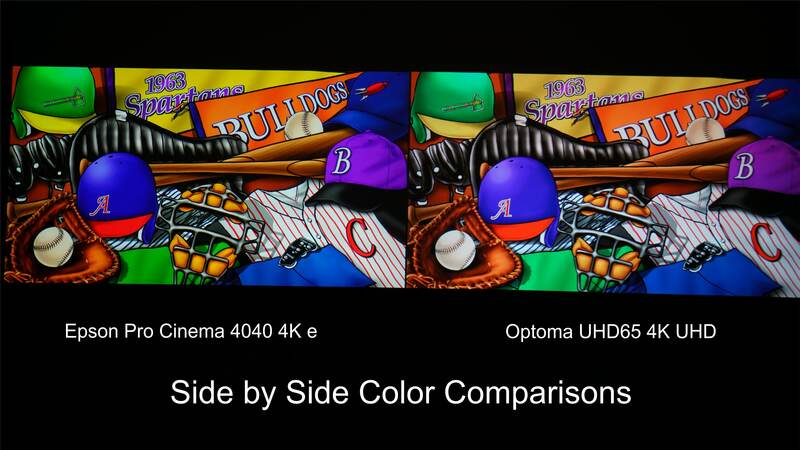 Contrast between the Epson Pro Cinema 4040 and the Optoma UHD65 was almost identical to the eye. Blacks were both very good, but not as deep and dark as the Sony VPL-VW365ES and the Epson 10500. We did note that in some scenes we could detect the blacks changing on the Epson due to its iris, however it was not noticeable on all scene changes. As you view the above image, the most apparent difference is not the contrast but the slight difference in color balance. The Epson is a little green and the Optoma is a little on the magenta side. It is interesting how the camera seems to amplify this difference, as in person it was not that different. But as can be seen from the grey scale at the beginning of this section, it was actually very close. You may wonder how these two projectors could be so close when it comes to contrast when they are listed by the manufacturers to be over 1,000,000:1 different in contrast! The Epson 4040 is listed at 160,000:1 and the UHD65 is listed at 1,200,000:1. It’s because they are using different ways of measuring contrast. The only practical measurement of contrast, is ANSI contrast, which includes both pure white and pure black on the screen at the same time. Most manufacturers including Optoma, Sony, and Epson do not state the ANSI contrast. Even if they did, it does not tell you how deep and dark the blacks are in a darkened room. The only real way to compare projectors is a side-by-side comparison. 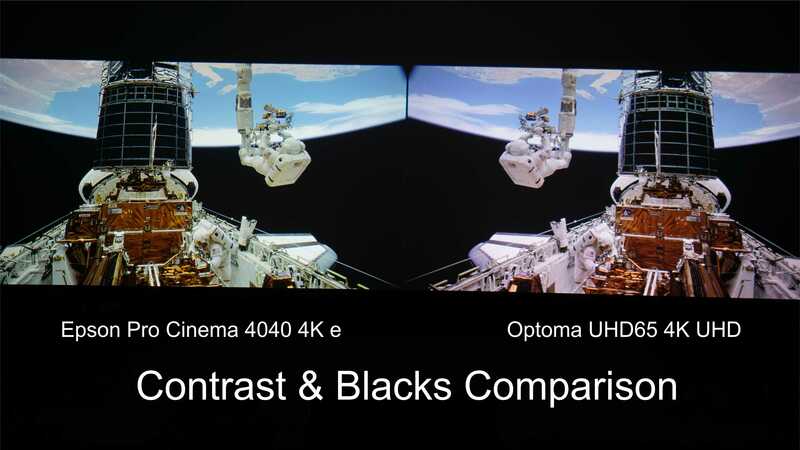 We are able to say that in the case of the 4040 and the UHD65, the contrast is very comparable as are the black levels. Both the Epson 4040 and the Optoma UHD65 had about the same brightness or light output in this, their best color settings. We would reccomend staying in the 102″ or 105″ max screen size to get a good bright image in a controlled-light (dark) room. The image above was another surprise, as the Optoma was able to reproduce detail in the star field that the Epson simply could not. 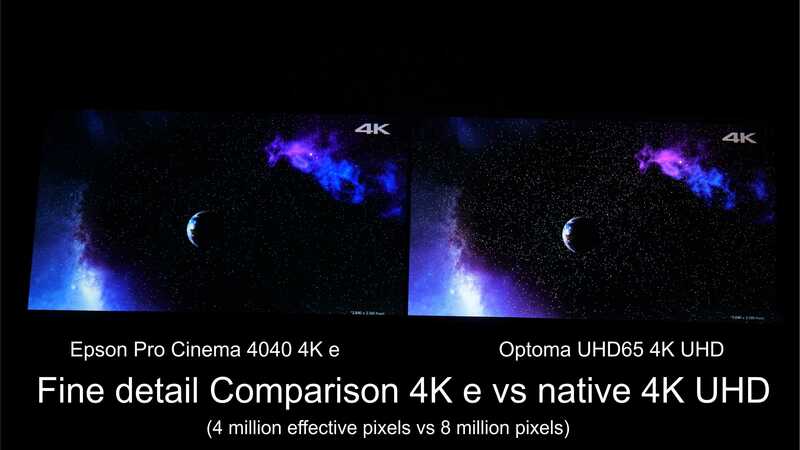 We concluded that this was a very good image to show the difference between 4K e-shift which is 4 million pixels vs. the Optoma with its 8 million pixels delivered to the screen. You can clearly see many, many stars that are just not visible on the Epson. Each projector can reproduce very good 1080p or HD images. The real separation came when you put high quality 4K source material into the projectors. If you are planning on collecting 4K Blu-ray discs or enjoy 4K streaming as the technology improves, then the Optoma is certainly a projector worth considering. This entry was posted in AV Solutions, Home Theater and tagged 4k, color, comparisonr, Contrast, detail, Epson, home theater, home theater projector, LCD, Optoma, Optoma UHD65, pro Cinema, Pro cinema 4040, projector, Review, UHD, UHD65. will you have a comparative with UHD60? Do you think that with the right adjustments/calibration can we generate a very good image on a 150″ screen (matte white 1.1 gain)? Currently, I have an Epson 5020UB, will improve my picture with UHD65? We are not planning on a UHD60 comparison because the UHD60 does not have the RGBRGB color wheel, or the level of contrast or motion processing to compete at this level. If you are willing to sacrifice a little of the rich accurate color you might be able to do a 150″ screen in the “Vivid” color mode but a 105″ would be better. 150″ is pushing it, we would recommend a 102″-105″ max. I appreciate a lot your comments and recommendations. Surely I´ll put them in execution as soon as I have the new UHD65.